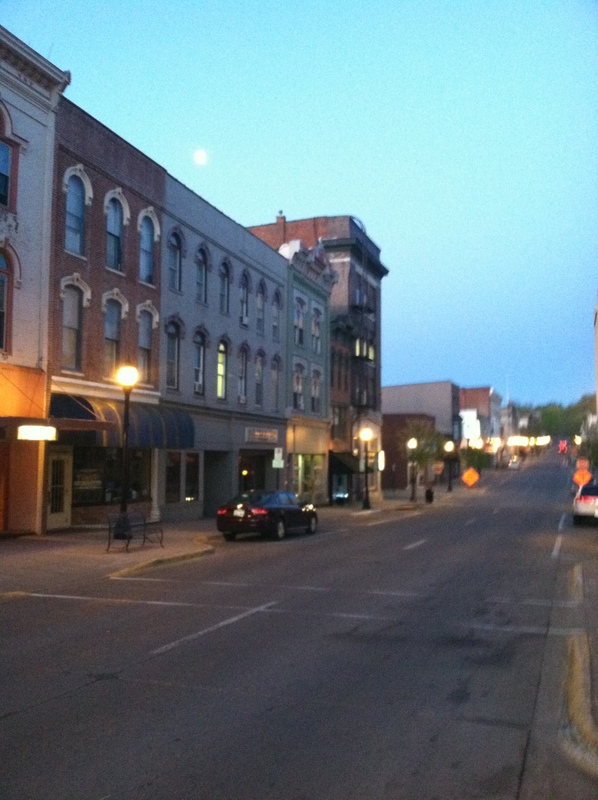 The moon was still shining brightly early Tuesday over downtown Muscatine. This is how it looked from Warrior CrossFit at 211 E. Second St. But our meeting Tuesday at Warrior CrossFit Muscatine was just the first of what are likely to be several encounters at the gym Jacob and Sarah Garvin opened in August at 211 E. Second St. Cindy is one of the benchmark workouts for CrossFit Inc., a fitness company founded in 2000 by Greg Glassman. Jacob Garvin was introduced to CrossFit in 2008, when he was deployed to Iraq with the U.S. Air Force. He and Sarah decided to open their gym in Muscatine, because it is where much of his family lives. He is the son of Tim and Susan Garvin. His grandmother, Jeanne Garvin, is a retired nurse and administrator who has become one of my many friends at the Muscatine Community Y. That may have been one of the reasons Jacob and Sarah contacted me with an offer: Would I be willing to accept a free trial membership and then blog about the experience? At this point, it must be pointed out that there are people in my former profession who would frown upon such an arrangement even though it’s not difficult to find many examples of newspaper reporters who have done similar stories. I’m OK with my agreement with Jacob and Sarah. I made no promises about what I would write and they didn’t ask for any. And so I found myself in their gym at 6:30 a.m. Tuesday. After filling out some paperwork and going through a brief orientation with Jacob, it was time to confront Cindy: Sets of five pull-ups, 10 push-ups and 15 squats done as many times as possible in 20 minutes. Because I was a CrossFit virgin, and also probably because Jacob feared I’d never make it, he scaled the workout back to 15 minutes. In that span, I did eight sets of the three exercises. 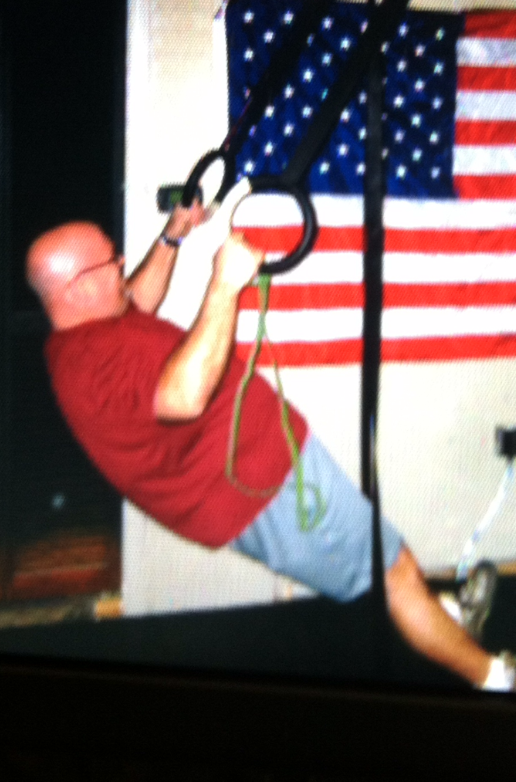 For most of the pull-ups, I did a modified exercise, using the rings shown here to do a sort of horizontal pull-up. They still weren’t easy and starkly highlighted the room that exists for improvement. The push-ups and squats were a little easier, I’d guess, because I’ve been doing plenty of them at the Y. But Jacob quickly proved I could do much deeper squats than what I have been doing. For now, I have no idea where any of this will lead. I can say, however, that I enjoyed Round 1 enough that I plan to show up Thursday for Round 2. Go for it, crossfit is tough for anyone, especially a “crossfit virgin”. I do it to help my ice hockey. I do hope it will work for you. Just moan and groan like the rest of them. I will say this you are always willing to try new things. I know Jacob and Sarah will benefit from your arrangement. You know those people just moan and groan but come back for more there must be something to it. Good picture! I’ll work on him, Jeanne. At least I will if I summon up the power to go back tomorrow.